This is the second discussion of a several part series leading from the genome, to protein synthesis (1), posttranslational modification of proteins (2), examples of protein effects on metabolism and signaling pathways (3), and leading to disruption of signaling pathways in disease (4), and effects leading to mutagenesis. Acetylation occurs as a co-translational and post-translational modification of proteins, for example, histones, p53, and tubulins. As noted above, the large number of different PTMs precludes a thorough review of all possible protein modifications. Therefore, this overview only touches on a small number of the most common types of PTMs studied in protein research today. Furthermore, greater focus is placed on phosphorylation, glycosylation and ubiquitination, and therefore these PTMs are described in greater detail on pages dedicated to the respective PTM. PhosphorylationReversible protein phosphorylation, principally on serine, threonine or tyrosine residues, is one of the most important and well-studied post-translational modifications. Phosphorylation plays critical roles in the regulation of many cellular processes including cell cycle, growth, apoptosis and signal transduction pathways. GlycosylationProtein glycosylation is acknowledged as one of the major post-translational modifications, with significant effects on protein folding, conformation, distribution, stability and activity. Glycosylation encompasses a diverse selection of sugar-moiety additions to proteins that ranges from simple monosaccharide modifications of nuclear transcription factors to highly complex branched polysaccharide changes of cell surface receptors. Carbohydrates in the form of aspargine-linked (N-linked) or serine/threonine-linked (O-linked) oligosaccharides are major structural components of many cell surface and secreted proteins. UbiquitinationUbiquitin is an 8-kDa polypeptide consisting of 76 amino acids that is appended to lysine in target proteins via the C-terminal glycine of ubiquitin. A ubiquitin polymer is formed after initial monoubiquitination. Polyubiquitinated proteins are degraded recycling the ubiquitin. All free cysteines are blocked. All remaining cysteines (presumably only those that are denitrosylated) are denitrosylated. The now-free thiol groups are then biotinylated. Biotinylated proteins are detected by SDS-PAGE and Western blot analysis or mass spectrometry (7). MethylationThe transfer of one-carbon methyl groups to nitrogen or oxygen (N- and O-methylation, respectively) to amino acid side chains increases the hydrophobicity of the protein and can neutralize a negative amino acid charge when bound to carboxylic acids. Methylation is mediated by methyltransferases, and S-adenosyl methionine (SAM) is the primary methyl group donor.Methylation occurs so often that SAM has been suggested to be the most-used substrate in enzymatic reactions after ATP (4). Additionally, while N-methylation is irreversible, O-methylation is potentially reversible. Methylation is a well-known mechanism of epigenetic regulation, as histone methylation and demethylation influences the availability of DNA for transcription. N-AcetylationN-acetylation, or the transfer of an acetyl group to nitrogen, occurs in almost all eukaryotic proteins through both irreversible and reversible mechanisms. N-terminal acetylation requires the cleavage of the N-terminal methionine by methionine aminopeptidase (MAP) before replacing the amino acid with an acetyl group from acetyl-CoA by N-acetyltransferase (NAT) enzymes. This type of acetylation is co-translational, in that N-terminus is acetylated on growing polypeptide chains that are still attached to the ribosome.Acetylation at the ε-NH2 of lysine (termed lysine acetylation) on histone N-termini is a common method of regulating gene transcription. Histone acetylation is a reversible event that reduces chromosomal condensation to promote transcription, and the acetylation of these lysine residues is regulated by transcription factors that contain histone acetyletransferase (HAT) activity. While transcription factors with HAT activity act as transcription co-activators, histone deacetylase (HDAC) enzymes are co-repressors that reverse the effects of acetylation by reducing the level of lysine acetylation and increasing chromosomal condensation.Sirtuins (silent information regulator) are a group of NAD-dependent deacetylases that target histones. As their name implies, they maintain gene silencing by hypoacetylating histones and have been reported to aid in maintaining genomic stability (8).Cytoplasmic proteins may also be acetylated, and therefore acetylation seems to play a greater role in cell biology than simply transcriptional regulation (9). Furthermore, crosstalk between acetylation and other post-translational modifications, including phosphorylation, ubiquitination and methylation, can modify the biological function of the acetylated protein (10). Each type of modification gives proteins distinct membrane affinities, although all types of lipidation increase the hydrophobicity of a protein and thus its affinity for membranes. The different types of lipidation are not mutually exclusive, in that two or more lipids can be attached to a given protein. GPI anchors tether cell surface proteins to the plasma membrane. These hydrophobic moieties are prepared in the ER, where they are then added to the nascent protein en bloc. GPI-anchored proteins are often localized to cholesterol- and sphingolipid-rich lipid rafts, which act as signaling platforms on the plasma membrane. N-myristoylation is a method to give proteins a hydrophobic handle for membrane localization. The myristoyl group is a 14-carbon saturated fatty acid (C14), which gives the protein sufficient hydrophobicity and affinity for membranes, but not enough to permanently anchor the protein in the membrane. N-myristoylation can therefore act as a conformational localization switch, in which protein conformational changes influence the availability of the handle for membrane attachment. N-myristoylation, facilitated specifically by N-myristoyltransferase (NMT), uses myristoyl-CoA to attach the myristoyl group to the N-terminal glycine. This PTM requires methionine cleavage prior to addition of the myristoyl group because methionine is the N-terminal amino acid of all eukaryotic proteins. S-palmitoylation adds a C16 palmitoyl group from palmitoyl-CoA to the thiolate side chain of cysteine residues via palmitoyl acyl transferases (PATs). Because of the longer hydrophobic group, this anchor can permanently anchor the protein to the membrane. S-palmitoylation is used as an on/off switch to regulate membrane localization. S-prenylation covalently adds a farnesyl (C15) or geranylgeranyl (C20) group to specific cysteine residues within 5 amino acids from the C-terminus via farnesyl transferase (FT) or geranylgeranyl transferases (GGT I and II). All members of the Ras superfamily are prenylated. These proteins have specific 4-amino acid motifs at the C-terminus that determine the type of prenylation at single or dual cysteines. Prenylation occurs in the ER and is often part of a stepwise process of PTMs that is followed by proteolytic cleavage by Rce1 and methylation by isoprenyl cysteine methyltransferase (ICMT). ProteolysisPeptide bonds are indefinitely stable under physiological conditions, and therefore cells require some mechanism to break these bonds. Proteases comprise a family of enzymes that cleave the peptide bonds of proteins and are critical in antigen processing, apoptosis, surface protein shedding and cell signaling.Degradative proteolysis is critical to remove unassembled protein subunits and misfolded proteins and to maintain protein concentrations at homeostatic concentrations.Proteolysis is a thermodynamically favorable and irreversible reaction. Therefore, protease activity is tightly regulated to avoid uncontrolled proteolysis through temporal and/or spatial control mechanisms including regulation by cleavage in cis or trans and compartmentalization (e.g., proteasomes, lysosomes). International Human Genome Sequencing Consortium (2004) Finishing the euchromatic sequence of the human genome. Nature. 431, 931-45. Jensen O. N. (2004) Modification-specific proteomics: Characterization of post-translational modifications by mass spectrometry. Curr Opin Chem Biol. 8, 33-41. Ayoubi T. A. and Van De Ven W. J. (1996) Regulation of gene expression by alternative promoters. FASEB J. 10, 453-60. 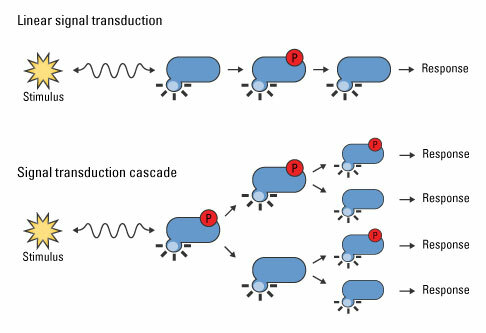 Walsh C. (2006) Posttranslational modification of proteins : Expanding nature’s inventory. Englewood, Colo.: Roberts and Co. Publishers. xxi, 490 p. p.
Gaston B. M. et al. (2003) S-nitrosylation signaling in cell biology. Mol Interv. 3, 253-63. Jaffrey S. R. and Snyder S. H. (2001) The biotin switch method for the detection of S-nitrosylated proteins. Sci STKE. 2001, pl1. Han P. and Chen C. (2008) Detergent-free biotin switch combined with liquid chromatography/tandem mass spectrometry in the analysis of S-nitrosylated proteins. Rapid Commun Mass Spectrom. 22, 1137-45. Imai S. et al. (2000) Transcriptional silencing and longevity protein SIR2 is an NAD-dependent histone deacetylase. Nature. 403, 795-800. Glozak M. A. et al. (2005) Acetylation and deacetylation of non-histone proteins. Gene. 363, 15-23. Protein phosphorylation is a post-translational modification of proteins in which a serine, a threonine or a tyrosine residue is phosphorylated by a protein kinase by the addition of a covalently bound phosphate group. Regulation of proteins by phosphorylation is one of the most common modes of regulation of protein function, and is often termed “phosphoregulation”. In almost all cases of phosphoregulation, the protein switches between a phosphorylated and an unphosphorylated form, and one of these two is an active form, while the other one is an inactive form. In some reactions, the purpose of phosphorylation is to “activate” or “volatize” a molecule, increasing its energy so it is able to participate in a subsequent reaction with a negativefree-energy change. 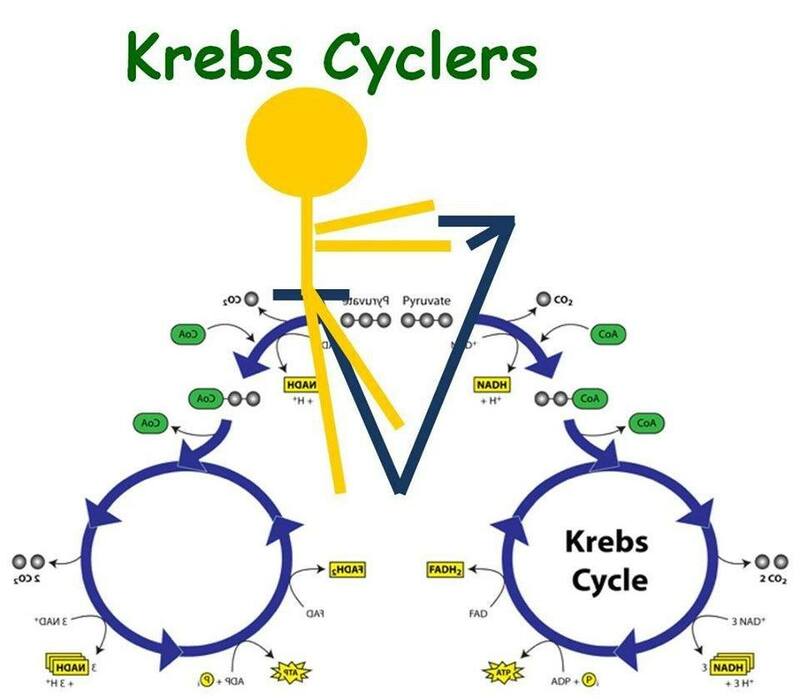 All kinases require a divalent metal ion such as Mg2+ or Mn2+ to be present, which stabilizes the high-energy bonds of the donor molecule (usually ATP or ATP derivative) and allows phosphorylation to occur. In other reactions, phosphorylation of a protein substrate can inhibit its activity (as when AKT phosphorylates the enzyme GSK-3). One common mechanism for phosphorylation-mediated enzyme inhibition was demonstrated in the tyrosine kinase called “src” (pronounced “sarc”, see: Src (gene)). When src is phosphorylated on a particular tyrosine, it folds on itself, and thus masks its own kinase domain, and is thus turned “off”. In still other reactions, phosphorylation of a protein causes it to be bound to other proteins which have “recognition domains” for a phosphorylated tyrosine, serine, or threoninemotif. As a result of binding a particular protein, a distinct signaling system may be activated or inhibited. In the late 1990s it was recognized that phosphorylation of some proteins causes them to be degraded by the ATP-dependent ubiquitin/proteasome pathway. These target proteins become substrates for particular E3 ubiquitin ligases only when they are phosphorylated. Oxidative phosphorylation (or OXPHOS in short) is the metabolic pathway in which the mitochondria in cellsuse their structure, enzymes, and energy released by the oxidation of nutrients to reform ATP. Although the many forms of life on earth use a range of different nutrients, ATP is the molecule that supplies energy tometabolism. Almost all aerobic organisms carry out oxidative phosphorylation. This pathway is probably so pervasive because it is a highly efficient way of releasing energy, compared to alternative fermentationprocesses such as anaerobic glycolysis. During oxidative phosphorylation, electrons are transferred from electron donors to electron acceptors such as oxygen, in redox reactions. These redox reactions release energy, which is used to form ATP. In eukaryotes, these redox reactions are carried out by a series of protein complexes within the cell’s intermembrane wall mitochondria, whereas, in prokaryotes, these proteins are located in the cells’ intermembrane space. The electron transport chain in the mitochondrion is the site of oxidative phosphorylation in eukaryotes. 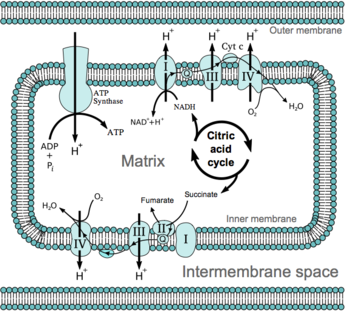 The NADH and succinate generated in the citric acid cycle are oxidized, releasing energy to power the ATP synthase. These linked sets of proteins are called electron transport chains. In eukaryotes, five main protein complexes are involved, whereas in prokaryotes many different enzymes are present, using a variety of electron donors and acceptors. The energy released by electrons flowing through this electron transport chain is used to transport protons across the inner mitochondrial membrane, in a process called electron transport. This generates potential energy in the form of a pH gradient and an electrical potential across this membrane. This store of energy is tapped by allowing protons to flow back across the membrane and down this gradient, through a large enzymecalled ATP synthase; this process is known as chemiosmosis. This enzyme uses this energy to generate ATP from adenosine diphosphate (ADP), in a phosphorylation reaction. This reaction is driven by the proton flow, which forces the rotation of a part of the enzyme; the ATP synthase is a rotary mechanical motor. Although oxidative phosphorylation is a vital part of metabolism, it produces reactive oxygen species such assuperoxide and hydrogen peroxide, which lead to propagation of free radicals, damaging cells and contributing to disease and, possibly, aging (senescence). The enzymes carrying out this metabolic pathway are also the target of many drugs and poisons that inhibit their activities. Oxidative phosphorylation works by using energy-releasing chemical reactions to drive energy-requiring reactions: The two sets of reactions are said to be coupled. This means one cannot occur without the other. The flow of electrons through the electron transport chain, from electron donors such as NADH to electron acceptors such as oxygen, is anexergonic process – it releases energy, whereas the synthesis of ATP is an endergonic process, which requires an input of energy. Both the electron transport chain and the ATP synthase are embedded in a membrane, and energy is transferred from electron transport chain to the ATP synthase by movements of protons across this membrane, in a process called chemiosmosis. In practice, this is like a simple electric circuit, with a current of protons being driven from the negative N-side of the membrane to the positive P-side by the proton-pumping enzymes of the electron transport chain. These enzymes are like a battery, as they perform work to drive current through the circuit. The movement of protons creates an electrochemical gradient across the membrane, which is often called the proton-motive force. It has two components: a difference in proton concentration (a H+gradient, ΔpH) and a difference in electric potential, with the N-side having a negative charge. 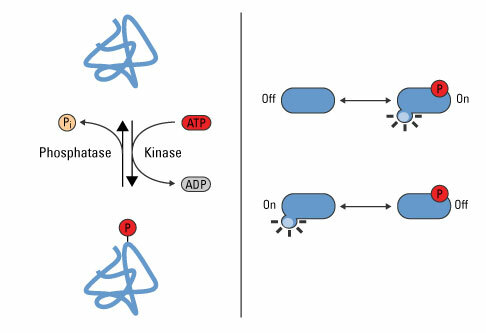 ATP synthase releases this stored energy by completing the circuit and allowing protons to flow down the electrochemical gradient, back to the N-side of the membrane. This kinetic energy drives the rotation of part of the enzymes structure and couples this motion to the synthesis of ATP. The two components of the proton-motive force are thermodynamically equivalent: In mitochondria, the largest part of energy is provided by the potential; in alkaliphile bacteria the electrical energy even has to compensate for a counteracting inverse pH difference. Inversely, chloroplasts operate mainly on ΔpH. However, they also require a small membrane potential for the kinetics of ATP synthesis. 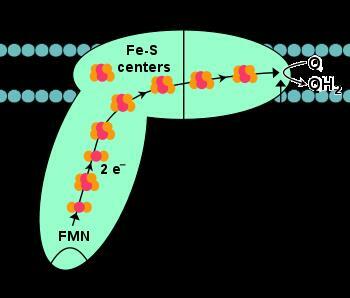 At least in the case of the fusobacterium P. modestum it drives the counter-rotation of subunits a and c of the FO motor of ATP synthase. The amount of energy released by oxidative phosphorylation is high, compared with the amount produced by anaerobic fermentation. Glycolysis produces only 2 ATP molecules, but somewhere between 30 and 36 ATPs are produced by the oxidative phosphorylation of the 10 NADH and 2 succinate molecules made by converting one molecule of glucoseto carbon dioxide and water, while each cycle of beta oxidation of a fatty acid yields about 14 ATPs. These ATP yields are theoretical maximum values; in practice, some protons leak across the membrane, lowering the yield of ATP. Reduction of coenzyme Q from itsubiquinone form (Q) to the reduced ubiquinol form (QH2). NADH-coenzyme Q oxidoreductase, also known as NADH dehydrogenase or complex I, is the first protein in the electron transport chain. Complex I is a giant enzyme with the mammalian complex I having 46 subunits and a molecular mass of about 1,000 kilodaltons (kDa). The structure is known in detail only from a bacterium; in most organisms the complex resembles a boot with a large “ball” poking out from the membrane into the mitochondrion. The genes that encode the individual proteins are contained in both the cell nucleus and themitochondrial genome, as is the case for many enzymes present in the mitochondrion. Succinate-Q oxidoreductase, also known as complex II or succinate dehydrogenase, is a second entry point to the electron transport chain. It is unusual because it is the only enzyme that is part of both the citric acid cycle and the electron transport chain. 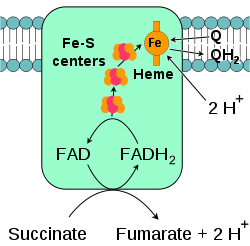 Complex II consists of four protein subunits and contains a bound flavin adenine dinucleotide (FAD) cofactor, iron–sulfur clusters, and a hemegroup that does not participate in electron transfer to coenzyme Q, but is believed to be important in decreasing production of reactive oxygen species. It oxidizes succinate to fumarate and reduces ubiquinone.As this reaction releases less energy than the oxidation of NADH, complex II does not transport protons across the membrane and does not contribute to the proton gradient. In some eukaryotes, such as the parasitic worm Ascaris suum, an enzyme similar to complex II, fumarate reductase (menaquinol:fumarate oxidoreductase, or QFR), operates in reverse to oxidize ubiquinol and reduce fumarate. This allows the worm to survive in the anaerobic environment of the large intestine, carrying out anaerobic oxidative phosphorylation with fumarate as the electron acceptor. Another unconventional function of complex II is seen in the malaria parasite Plasmodium falciparum. Here, the reversed action of complex II as an oxidase is important in regenerating ubiquinol, which the parasite uses in an unusual form ofpyrimidine biosynthesis. In mammals, this metabolic pathway is important in beta oxidation of fatty acids and catabolism of amino acids and choline, as it accepts electrons from multiple acetyl-CoAdehydrogenases. In plants, ETF-Q oxidoreductase is also important in the metabolic responses that allow survival in extended periods of darkness. Q-cytochrome c oxidoreductase is also known as cytochrome c reductase, cytochrome bc1 complex, or simply complex III. In mammals, this enzyme is a dimer, with each subunit complex containing 11 protein subunits, an [2Fe-2S] iron–sulfur cluster and three cytochromes: one cytochrome c1 and two bcytochromes. 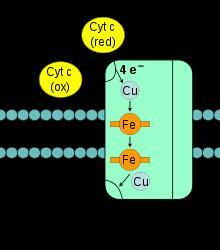 A cytochrome is a kind of electron-transferring protein that contains at least one hemegroup. The iron atoms inside complex III’s heme groups alternate between a reduced ferrous (+2) and oxidized ferric (+3) state as the electrons are transferred through the protein. As only one of the electrons can be transferred from the QH2 donor to a cytochrome c acceptor at a time, the reaction mechanism of complex III is more elaborate than those of the other respiratory complexes, and occurs in two steps called the Q cycle. 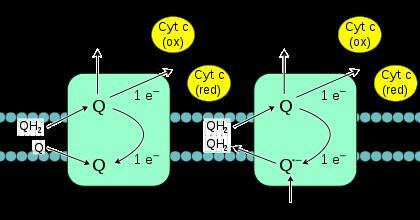 In the first step, the enzyme binds three substrates, first, QH2, which is then oxidized, with one electron being passed to the second substrate, cytochrome c. The two protons released from QH2 pass into the intermembrane space. The third substrate is Q, which accepts the second electron from the QH2 and is reduced to Q.-, which is the ubisemiquinone free radical. The first two substrates are released, but this ubisemiquinone intermediate remains bound. In the second step, a second molecule of QH2 is bound and again passes its first electron to a cytochrome c acceptor. The second electron is passed to the bound ubisemiquinone, reducing it to QH2 as it gains two protons from the mitochondrial matrix. This QH2 is then released from the enzyme. For more details on this topic, see cytochrome c oxidase. 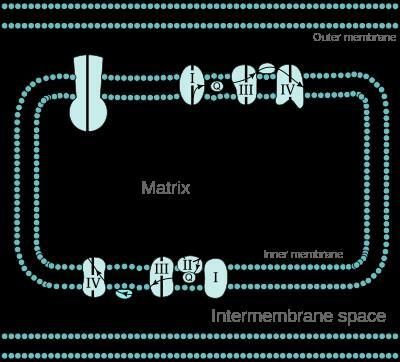 The original model for how the respiratory chain complexes are organized was that they diffuse freely and independently in the mitochondrial membrane. However, recent data suggest that the complexes might form higher-order structures called supercomplexes or “respirasomes.” In this model, the various complexes exist as organized sets of interacting enzymes. These associations might allow channeling of substrates between the various enzyme complexes, increasing the rate and efficiency of electron transfer. Within such mammalian supercomplexes, some components would be present in higher amounts than others, with some data suggesting a ratio between complexes I/II/III/IV and the ATP synthase of approximately 1:1:3:7:4. However, the debate over this supercomplex hypothesis is not completely resolved, as some data do not appear to fit with this model. Reversible protein phosphorylation, principally on serine, threonine or tyrosine residues, is one of the most important and well-studied post-translational modifications. Phosphorylation plays critical roles in the regulation of many cellular processes including cell cycle, growth, apoptosis and signal transduction pathways. Phosphorylation is the most common mechanism of regulating protein function and transmitting signals throughout the cell. While phosphorylation has been observed in bacterial proteins, it is considerably more pervasive in eukaryotic cells. It is estimated that one-third of the proteins in the human proteome are substrates for phosphorylation at some point (1). Indeed, phosphoproteomics has been established as a branch of proteomics that focuses solely on the identification and characterization of phosphorylated proteins. While phosphorylation is a prevalent post-translational modification (PTM) for regulating protein function, it only occurs at the side chains of three amino acids, serine, threonine and tyrosine, in eukaryotic cells. These amino acids have a nucleophilic (–OH) group that attacks the terminal phosphate group (γ-PO32-) on the universal phosphoryl donor adenosine triphosphate (ATP), resulting in the transfer of the phosphate group to the amino acid side chain. This transfer is facilitated by magnesium (Mg2+), which chelates the γ- and β-phosphate groups to lower the threshold for phosphoryl transfer to the nucleophilic (–OH) group. This reaction is unidirectional because of the large amount of free energy that is released when the phosphate-phosphate bond in ATP is broken to form adenosine diphosphate (ADP). Diagram of serine phosphorylation. 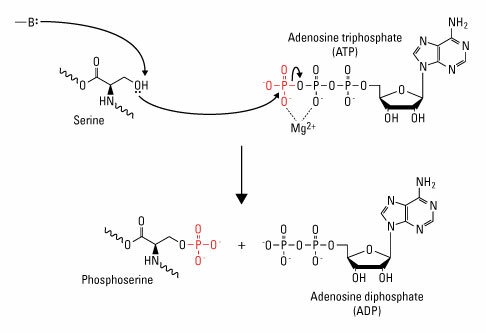 Enzyme-catalyzed proton transfer from the (–OH) group on serine stimulates the nucleophilic attack of the γ-phosphate group on ATP, resulting in transfer of the phosphate group to serine to form phosphoserine and ADP. (—B:) indicates the enzyme base that initiates proton transfer. For a large subset of proteins, phosphorylation is tightly associated with protein activity and is a key point of protein function regulation. Phosphorylation regulates protein function and cell signaling by causing conformational changes in the phosphorylated protein. These changes can affect the protein in two ways. First, conformational changes regulate the catalytic activity of the protein. Thus, a protein can be either activated or inactivated by phosphorylation. Second, phosphorylated proteins recruit neighboring proteins that have structurally conserved domains that recognize and bind to phosphomotifs. These domains show specificity for distinct amino acids. For example, Src homology 2 (SH2) and phosphotyrosine binding (PTB) domains show specificity for phosphotyrosine (pY), although distinctions in these two structures give each domain specificity for distinct phosphotyrosine motifs (2). Phosphoserine (pS) recognition domains include MH2 and the WW domain, while phosphothreonine (pT) is recognized by forkhead-associated (FHA) domains. The ability of phosphoproteins to recruit other proteins is critical for signal transduction, in which downstream effector proteins are recruited to phosphorylated signaling proteins. Protein phosphorylation is a reversible PTM that is mediated by kinases and phosphatases, which phosphorylate and dephosphorylate substrates, respectively. These two families of enzymes facilitate the dynamic nature of phosphorylated proteins in a cell. Indeed, the size of the phosphoproteome in a given cell is dependent upon the temporal and spatial balance of kinase and phosphatase concentrations in the cell and the catalytic efficiency of a particular phosphorylation site. Phosphorylation is a reversible PTM that regulates protein function. Left panel: Protein kinases mediate phosphorylation at serine, threonine and tyrosine side chains, and phosphatases reverse protein phosphorylation by hydrolyzing the phosphate group. Right panel: Phosphorylation causes conformational changes in proteins that either activate (top) or inactivate (bottom) protein function. Kinases are enzymes that facilitate phosphate group transfer to substrates. Greater than 500 kinases have been predicted in the human proteome; this subset of proteins comprises the human kinome (3). Substrates for kinase activity are diverse and include lipids, carbohydrates, nucleotides and proteins.ATP is the cosubstrate for almost all protein kinases, although guanosine triphosphate is used by a small number of kinases. ATP is the ideal structure for the transfer of α-, β- or γ-phosphate groups for nucleotidyl-, pyrophosphoryl- or phosphoryltransfer, respectively (4). While the substrate specificity of kinases varies, the ATP-binding site is generally conserved (5).Protein kinases are categorized into subfamilies that show specificity for distinct catalytic domains and include tyrosine kinases or serine/threonine kinases. Approximately 80% of the mammalian kinome comprises serine/threonine kinases, and >90% of the phosphoproteome consists of pS and pT. Indeed, studies have shown that the relative abundance ratio of pS:pT:pY in a cell is 1800:200:1 (6). Although pY is not as prevalent as pS and pT, global tyrosine phosphorylation is at the forefront of biomedical research because of its relation to human disease via the dysregulation of receptor tyrosine kinases (RTKs).Protein kinase substrate specificity is based not only on the target amino acid but also on consensus sequences that flank it (7). These consensus sequences allow some kinases to phosphorylate single proteins and others to phosphorylate multiple substrates (>300) (5). Additionally, kinases can phosphorylate single or multiple amino acids on an individual protein if the kinase-specific consensus sequences are available. Kinases have regulatory subunits that function as activating or autoinhibitory domains and have various regulatory substrates. Phosphorylation of these subunits is a common approach to regulating kinase activity (8). Most protein kinases are dephosphorylated and inactive in the basal state and are activated by phosphorylation. A small number of kinases are constitutively active and are made intrinsically inefficient, or inactive, when phosphorylated. Some kinases, such as Src, require a combination of phosphorylation and dephosphorylation to become active, indicating the high regulation of this proto-oncogene. Scaffolding and adaptor proteins can also influence kinase activity by regulating the spatial relationship between kinases and upstream regulators and downstream substrates. The reversibility of protein phosphorylation makes this type of PTM ideal for signal transduction, which allows cells to rapidly respond to intracellular or extracellular stimuli. Signal transduction cascades are characterized by one or more proteins physically sensing cues, either through ligand binding, cleavage or some other response, that then relay the signal to second messengers and signaling enzymes. In the case of phosphorylation, these receptors activate downstream kinases, which then phosphorylate and activate their cognate downstream substrates, including additional kinases, until the specific response is achieved. Signal transduction cascades can be linear, in which kinase A activates kinase B, which activates kinase C and so forth. Signaling pathways have also been discovered that amplify the initial signal; kinase A activates multiple kinases, which in turn activate additional kinases. With this type of signaling, a single molecule, such as a growth factor, can activate global cellular programs such as proliferation (9). Signal transduction cascades amplify the signal output. External and internal stimuli induce a wide range of cellular responses through a series of second messengers and enzymes. Linear signal transduction pathways yield the sequential activation of a discrete number of downstream effectors, while other stimuli elicit signal cascades that amplify the initial stimulus for large-scale or global cellular responses. The human proteome is estimated to contain approximately 150 protein phosphatases, which show specificity for pS/pT and pY residues (10,11). 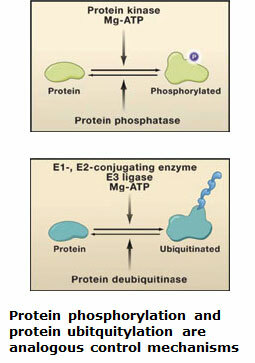 While dephosphorylation is the end goal of these two groups of phosphatases, they do it through separate mechanisms. Serine/threonine phosphatases mediate the direct hydrolysis of the phosphorus atom of the phosphate group using a bimetallic (Fe/Zn) center, while tyrosine phosphatases form a covalent thiophosphoryl intermediate that facilitates removal of the tyrosine residue. Almost all aspects of biology are regulated by reversible protein phosphorylation and ubiquitylation. Abnormalities in these pathways cause numerous diseases including cancer, neurodegeneration and inflammation – all conditions under intense scrutiny in our Unit. Deciphering how disruptions in phosphorylation and ubiquitin networks lead to disease will reveal novel drug targets and improved strategies to treat these maladies in the future. Protein ubiquitylation is analogous to protein phosphorylation except that ubiquitin molecules are attached covalently to Lys residues, as opposed to phosphate groups becoming covalently attached to one or more Ser, Thr or Tyr residues. Like phosphorylation, ubiquitylation can alter protein properties and functions in every conceivable way. Ubiquitylation is likely to be a more versatile control mechanism than phosphorylation, as ubiquitin molecules can not only be linked to one or more amino acid residues on the same protein, but can also form ubiquitin chains. Moreover, there are also several ubiquitin-like modifiers (ULMs), such as Nedd8, SUMO1, SUMO2, SUMO3, FAT10 and ISG15, which can become attached to proteins in reactions termed Neddylation, SUMOylation, Tenylation and ISGylation, while poly-SUMO chains (involving SUMO2 and SUMO3) are also formed in cells. Recent research has highlighted an exquisite interplay between phosphorylation and ubiquitin pathways that regulate many physiological systems. This includes pathways of relevance to understanding innate immunity, Parkinson’s disease and cancer, emphasising the importance of integrating phosphorylation and ubiquitylation research, and not considering these separate areas to be studied in isolation. The MRC-PPU research focuses on unravelling the roles of protein phosphorylation and ubiquitylation pathways that have strong links to understanding human disease. This is where we can make the best use of our expertise, grasp opportunities emerging from the golden era of genetic analysis of human disease, and make a significant contribution to medical research. Our Principal Investigators (PIs) deploy a blend of creativity, curiosity, expertise and state-of-the-art technology to tackle their selected projects. Their aim is to uncover fundamentally new knowledge on how biological systems are controlled, hopefully shedding novel insights into the understanding and treatment of disease. Effective translation of our research will also be impossible without robust interactions with drug discovery units such as the MRC Technology Centre for Therapeutics Discovery, the University of Dundee’s Drug Discovery Unit and close collaboration with pharmaceutical companies. The latter will be greatly enhanced by major collaborations with the six pharmaceutical companies that support the Division of Signal Transduction Therapy. Access to the exceptional support services available within the MRC-PPU and DSTT also helps to maximise the competitiveness of our research groups and reinforce collaborations with our external partners.